We are so excited to announce that The Welcoming Party will be part of the Ruhrtriennale’s 2018 Festival. 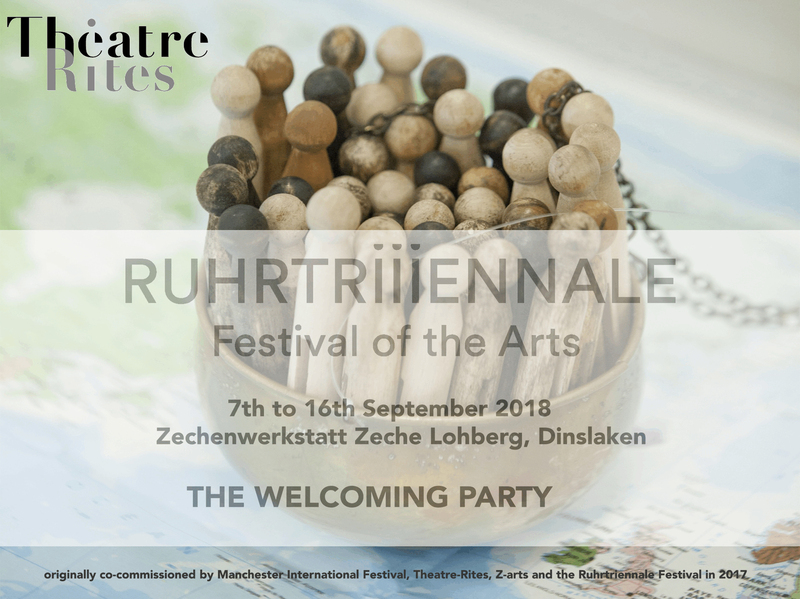 Originally co-commissioned by Manchester International Festival, Theatre-Rites, Z-arts and the Ruhrtriennale Festival, The Welcoming Party premiered at the Manchester International Festival in 2017. We will be reimagining the production for the Zechenwerkstatt Zeche Lohberg in Dinslaken with a cast reflecting the refugee experience in Germany. This site-specific promenade performance explores real experiences of refugee journeys, arrivals and the subsequent chaos, confusion and bureaucracy that ensues. “Done with the rackety swagger and invention that we’ve come to expect from Theatre-Rites, a company making shows for children that is right at the forefront of contemporary British theatre practice”. The Guardian. This marks Theatre-Rites’ fourth visit to the Ruhrtriennale having previously created two site-specific productions, Salt (2008) and Paradise (2010) as well as touring The Broke N Beat Collective to the 2017 Festival. As always it is a delight to work with the wonderful and dedicated teams at the Festival who have so diligently supported us over the last few months ensuring this reimagining has the same integrity of approach and content as our 2017 production in Manchester.